Try to add a tile that forms more than one line to score double points. Avoid creating lines that have 5 tiles because your opponents will add the 6th tile to score a Qwirkle. Count the tiles to make sure that your needed tile is still available in the bag. You should score at a minimum of 7 points per turn. If you can envisage any situation where you can set an opponent for a score more than 3.5 points above you, find something else. Get rid of one of them for low scores or exchange them. Certainly if you cannot get any productive play of more than four points from your rack, then you will want to consider an exchange. People recognise color better and faster than shape. 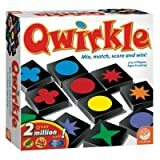 So, if there is a near-colored-Qwirkle, you can bet that your opponents have seen them. But a three-or-four tiles line of similar shape is often missed. This is maybe a nasty tip. When your opponents are a little tired, then turn the lights down. Consider carefully to maximise your own score or the block others. 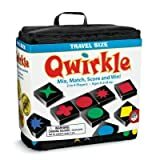 This is necessary to playing Qwirkle well. Use small two-tile combos to block certain possible Qwirkles. When the end game starts, then play one tile per turn. 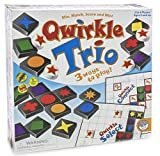 At this stage, it is unlikely that any qwirkle will be formed. Start by placing the tiles that produces the most points and hope that other players will add onto the board more valuable placement opportunities.